Cameron Abel was pulled through this culvert while tubing the Animas River north of Durango. The culvert is visible from downstream, seen here, but hidden from those going downriver. One second San Diego native Cameron Abel was trying to dislodge her inner tube from a pile of rocks in a shallow, serpentine part of the Animas River about one mile south of Trimble Lane. The next second she was gone. Her baffled family members searched frantically, thinking she was trapped by an eddy. 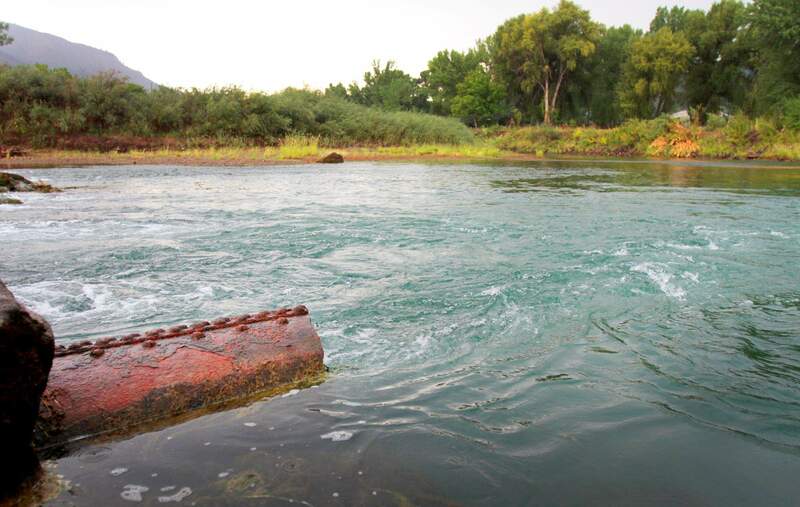 The 25-foot-long pipe Abel encountered is one of five adjacent steel culverts, each three feet in diameter, that span half of the Animas River on the property of James and Hannelore Hanks. The Hankses own land on both sides of the river and use the culverts as the base of a low-water crossing, made of concrete chunks and gravel, to reach the east bank on tractor. James Hanks said he installed the culverts 15 to 20 years ago, give or take. The culverts are built to code and in compliance with all federal and county floodplain regulations, according to Butch Knowlton, director of the Office of Emergency Management in La Plata County. For Abel, her familys float trip started out familiar and ordinary: the lazy river current, willow trees, boulders exposed by the late-summers low flow. The leisurely current carried Abel toward the right bank, where her tube became grounded on the rocks. Mindful that the riverfront property was probably private land, she dismounted and began to lift the tube out into moving water. The whole scene appeared pretty benign. I cant remember anything indicating it would be hazardous, Abel said. But in a flash, she was captured by the whirlpool-like suction effect created by the culverts underwater entrance and funneled inside. James Hanks said he takes no issue with canoes and other hard-body vessels, but was aghast that anyone would tube the river north of 32nd Street. The culvert has made news before. Nine years ago, a 27-year-old Durango woman was trapped inside for several minutes after her legs became entangled in her tube. She lost consciousness and ended up spending 20 hours in intensive care at Mercy Medical Center. Hanks said he has previously posted signs warning recreationists of the culverts presence, but said the signs had been removed. He wasnt sure by whom.